I am SOOOO excited to share with you our very FIRST Classy Cooking Contributor post!! We are so lucky to have Jen (my insanely gorgeous and talented sister in law!) from Yummy Healthy Easy here today! Hi everyone! 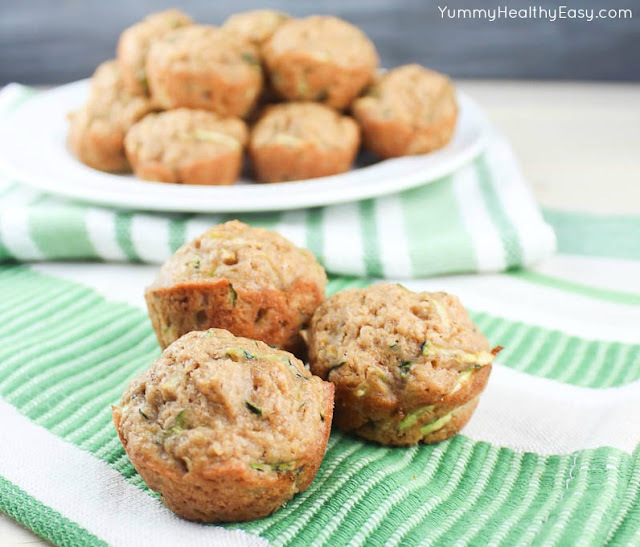 Jen from Yummy Healthy Easy here, and I’m super excited to share a yummy recipe with you for Mini Zucchini Muffins! Aren’t these little guys so cute?! I’ve been trying to get my kids to eat at least one vegetable or fruit at every meal. This is easier said than done, my friends! 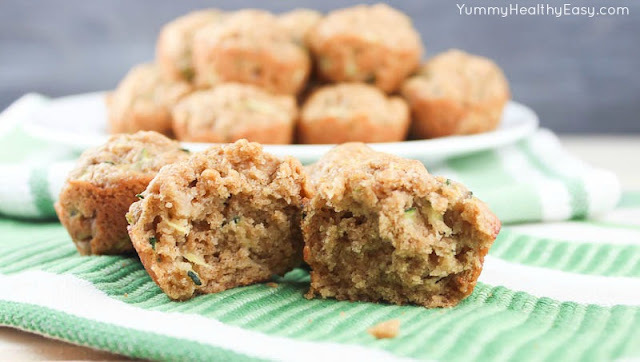 When I was flipping through a Cooking Light magazine, I saw a recipe for light zucchini muffins and I thought I’d give them a try. I wanted to see if my boys liked them regardless of the zucchini. Oh boy, did they ever! These little yummies were gone in a matter of minutes. Everyone in my family devoured them! 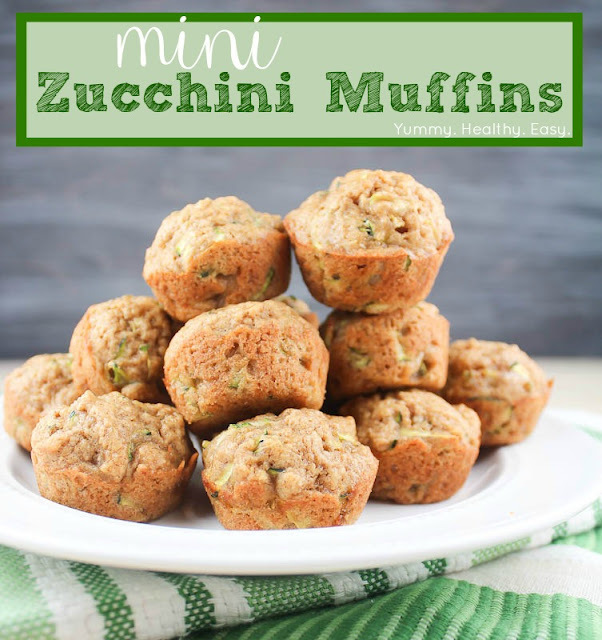 They are the perfect bite-size treat and are great for breakfast and/or snack time. PLUS they have zucchini in them…and last I checked, that was a vegetable. 😉 So these are a win-win in my book! Preheat oven to 400 degrees F. Lightly spray a mini (24 cup) muffin pan with cooking spray. Spoon flour into dry measuring cup, level with a knife and pour into large mixing bowl. Add brown sugar, baking powder, cinnamon, salt and allspice to mixing bowl and stir. In another smaller mixing bowl, combine zucchini, oil, melted butter, milk, vanilla and egg. Stir using a whisk. Add zucchini mixture to flour mixture, stirring batter just until combined. Using a small ice-cream scooper or spoon, scoop batter and place in 24 greased mini muffin cups. Bake at 400 degrees for 10-12 minutes, or until toothpick inserted in the center of muffin comes out clean. Hi! I’m Jen from Yummy Healthy Easy. I’m a recipe addict, cookbook collector, and all-around lover of food! I’m also a mom to four crazy boys. When I’m not carpooling them around to ball games or play dates, you can usually find me in my favorite room in the house – the kitchen – where I love creating yummy, healthy and easy recipes! I hope you’ll stop by and visit me soon! You can also find me on Facebook, Pinterest and Twitter! Thank you SO MUCH for sharing this delicious muffin recipe with us Jen! I can’t to try it! Head over to Jen’s blog for TONS of amazing recipes. These are looking sooooooooooooo tempting!! 29 Healthy After School Snack Ideas!